Are you using all the rooms in your home or apartment? Those of you who are in 600 square foot studio apartments may be saying, “I use every inch,” and yet my question still remains. Are you using your space and if so are you using it effectively, productively, and with intention? Metaphorically, how you use your space is how you embrace your life. This shifts over time, yet you may not recognize the significance of what “home” represents at different stages of your life if you are not mindful of these subtle changes. I am used to spreading out. Often, in my current home, there are rooms like my adult children’s bedrooms that I may not even enter for weeks. We have bathrooms that we have turned the water off in because no one is using them! Yet the illusion of space is there and I think that it erodes our perspectives. It is clearly time to move when the fit feels off. I know for me, moving from Bergen County NJ, where I have spent most of my life is going to have some bitter sweetness, yet, I also know that NYC is calling to me, as is apartment life. I recognize that our dream of having a home in Scottsdale, one that my husband and I have discussed for 3 decades, simply feels correct and actionable now. Although I am not looking forward to the physical moves between opposite coasts, I am looking forward to the alignment of space and place with who we are now. I am excited for choice, and chance, and the ability to organize and reposition from a different need and a shifted vantage point. If you want to re-focus on goals at hand, then is it not more productive to do so from a tighter, more aligned point of view? Making use of personal space in a way that resonates with your mental and physical arena provides a great way to hack into and up-charge your productivity and your energy. Just like your sense of purpose, and your values shift and transform over time, so does your need to fine-tune and identify where and how you are living. What is too much and what is too little? A bit of Goldilocks is perhaps involved in your decision making, but it makes so much sense to me that bigger does not always mean better. Just because you have lived someplace “forever” does not have any bearing on tomorrow. Essentially, how you use your space is about timing, proportion, and fit. 1. Reinvent your space: Have an excess of rooms that you never use? Reposition them. Perhaps a grown child’s bedroom is now the perfect office that you have always wanted. No longer need a playroom…how about a home gym? Having a shrine to what was, does not bring it back, or preserve it for infinity! Using what you have as a reflection of who you are today is both empowering and energizing. Conversely, struggling with tight quarters? Then maybe it is time to consider a larger home or apartment, or to coexist with a roommate in a bigger space than either of you can achieve on your own. Finding a roommate is no longer just for our post grad years. Women especially are seeking out roommates later in life post-divorce, or in widowhood, as a way to maximize money, space, and camaraderie. 2. Clean: Let’s face it, closets filled with clothing that does not fit, and attics storing boxes of unwanted items inherited, or forgotten weighs you down! There is something so enticing and refreshing about letting go of what you don’t need and what you will never use. Disposing of overflow does not always mean just giving it away (although your charitable gift is gold to someone in need.) It could also mean selling it. Repurposing clothing and collectibles virtually, or through a garage sale, or resale shop, can not only support you in creating space for what you do want in your life, it is also an instant stream of unanticipated cash flow. When you let go of things…you organically create physical and mental space to permit in something new and coveted. 3. Think like a realtor: A realtor would show your entire house, not just part of it. Are you showing all aspects of YOU? Are there rooms that you are hiding in whether in your home or in your heart? Doors you are not exiting from, physically or metaphorically? Your home can often become your comfort zone. This is a great foundation and support, yet if never expanded upon or refreshed, a gap can form between what the outside world sees and what an inside peek would reveal. You would not hesitate to mow your lawn, or decorate your living room, or paint your walls. Yet are you giving your personal self the same care, upkeep, and nurturing? Get a jump on “staging your home for resale” by investing in it and YOU right now! See the synergy? Make it work for you! Otherwise, it is like you are closing a door on a room you don’t want to deal with! Use your space…where your mind goes…you follow! Honored to be a featured expert for NJ.Com and The Bergen Record. Proud to be a contributor for Lesley Jane Seymour's Covey Club. Read the full post here! 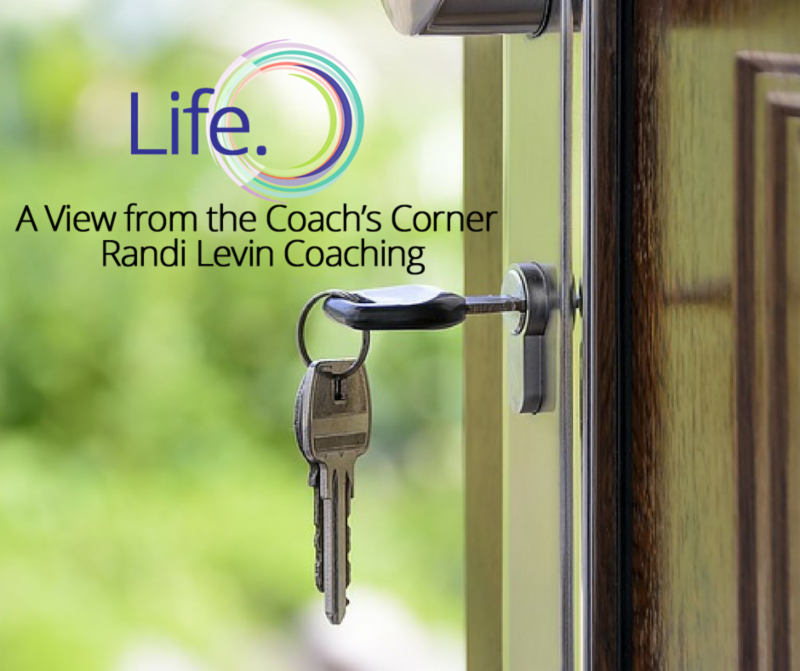 Randi Levin Coaching was recently featured in Amex OPEN!